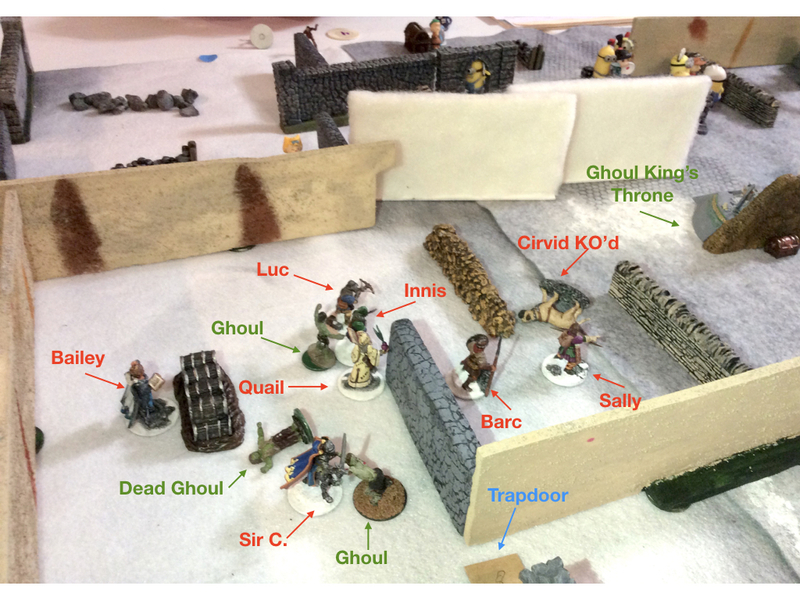 Frostgrave Campaign ’17, Game 8: The Lair of the Ghoul King & Queen | H.A.W.K.S. Chris Palmer This past Saturday we got together for the 8th game of our 2017 Frostgrave Campaign. We once again continued to make our way through the “Thaw of the Lich Lord” supplement book, and this month we did the Lair of the Ghoul King scenario. 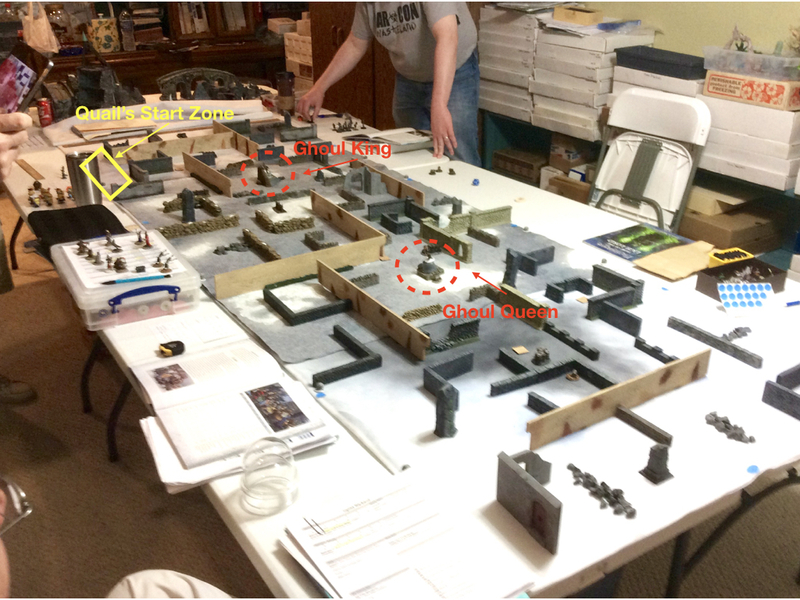 We only had 5 of our 9 regular players, so we modified the scenario to make it The Lair of the Ghoul King and Queen, adding a second throne. We also multiplied the trapdoors per player (2), times our 5 players, so we placed 10 trapdoors . And, given there were 5 of us, we placed the two treasures on opposite sides of each throne (2 treasures x 2 thrones), and then placed the other 11 treasures normally. 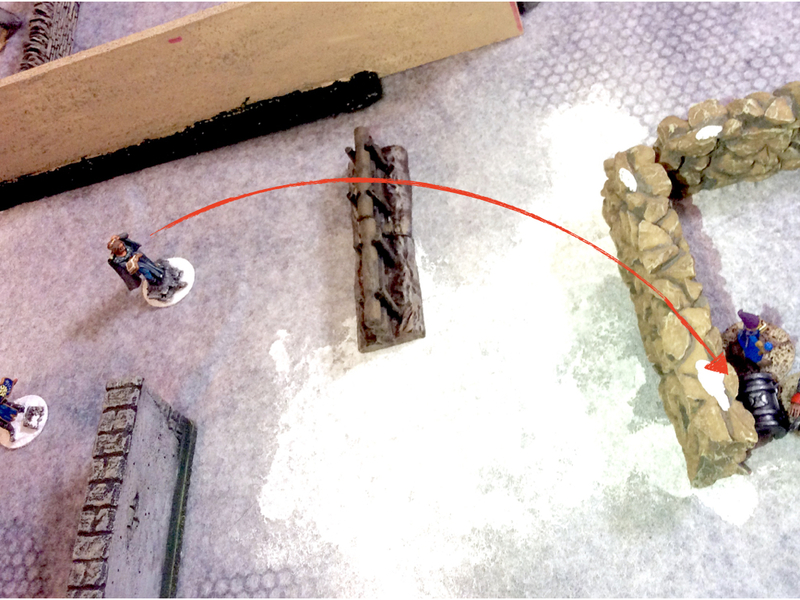 Each player was assigned two Ghouls to place during the game as per the scenario instructions. Also, since there were so few of us, we decided to determine initiative the normal way: with dice rolls, rather than our usual numbered poker chip method. Unfortunately, since I can’t roll dice to save my life, I got last choice of starting location and Quail entered on the back end of nowhere, with what looked like very little prospects in the way of treasure. It was, however, a corner spot, so she wouldn’t be surrounded on three sides. Across from her was Gru the Soothsayer, and to the right of her entry location was Bemis the other Sigilist. A view of the table before the game. Quails entry zone can be seen in the far back left corner. The weeks since the last expedition into Frostgrave had been stressful ones for the Sigilist Quailelyn. Her Apprentice, Bailisette, seemed little improved since the near-fatal magical Grenade attack and resultant scarring she suffered during their expedition two months ago; where they had fought against Bemis the Sigilist’s warband in the Library. And, since the humiliating defeat Bailey had suffered in last month’s foray, during an ill-advised attack on one of Bemis’ Treasure Hunters; it seemed to the Maga Librarian that on some days her Apprentice was even mentally worse than she had been last month. Bailey had gone from being quiet, withdraw, and perpetually distracting herself with busy work in the weeks after the initial attack, to, in the past few weeks, being angry and argumentative all the time. And the rest of the warband were becoming unsettled by it all. She had asked Sir Cardidil, the Knight, to give Bailey some sword fighting lessons, in hopes that getting the young woman outside and active, doing something proactive, might help. And it seemed to help a bit, because when Bailey was out there clashing blades with the knight, the Sigilist saw glimpses of the bright soul and mind she had brought with her from the University to be her Apprentice almost a year ago now. She also saw a raging anger and fierce fire in the young woman’s eyes as she wielded the weapon with a ferocity unlike the Apprentice’s thin, reserved, appearance would bely. But whenever Bailey was not out on the training field, the anger and argumentativeness flared anew, and it was spreading to other members of the group. The Ghoul King, on his throne, awaits his victims guests. The next morning Quail tried to interest Bailey in preparing potions for their trip, but the Apprentice simply stormed out of the great hall when she heard that the Sigilist had chosen to brew Explosive Cocktails for the trip. To Quail it seemed a sound choice given the rise in undead sightings they had been seeing in the city. (Quail successfully casts Brew Potion pre-game. Bailey fails to cast Brew Potion pre-game.) Later, as the group gathered outside their tower base, Quail handed the potion vial to Bailey, and said “Take this. I have no more room in my pockets and pouches.” (Quail was at 5 item limit.) Without a word, frowning, Bailisette reached out her hand and snatched the vial. The Apprentice’s arm then froze for a moment in mid movement, and the young woman slowly raised the hand grasping the vial to her face, and unflexed her fingers. Bailey stared at the clear red liquid frothing in its glass container as it rested on her palm, her eyes fixed upon it. Quail thought for just a second she saw Bailey’s eyes glint the same red as the liquid; then, before the Sigilist could consider this strange sight, as quickly as the Apprentice had snatched the vial, the young woman closed her hand around the smooth glass and shoved the vial deep into one of her pockets… a slight unseen smile coming over her scarred face. Once the band was in the city, it didn’t take them long to find the ruins of the old monastery complex. Quail looked around for a few minutes to get her bearings, and then located the steps they needed to get down into the underground chambers. As the group descended the staircase, the Sigilist was surprised to find a solid looking iron-braced oaken door swung open at the bottom. There was very little wooden structures left intact in the city after a 1000 years beneath the snow and ice, and to find a solid door like this was rather unusual, but Quail dismissed it as another of the strange sights one sees in this ancient city. "Well, we’ll see about that.“ the Maga Librarian said to no one in particular in her most authoritative voice, as if challenging one of the many students who had tried to test her mettle at the university; much to their dismay. Quail continued to the group around her, "The way I see it; the only way out of this is to push ahead,” and she motioned everyone forward. 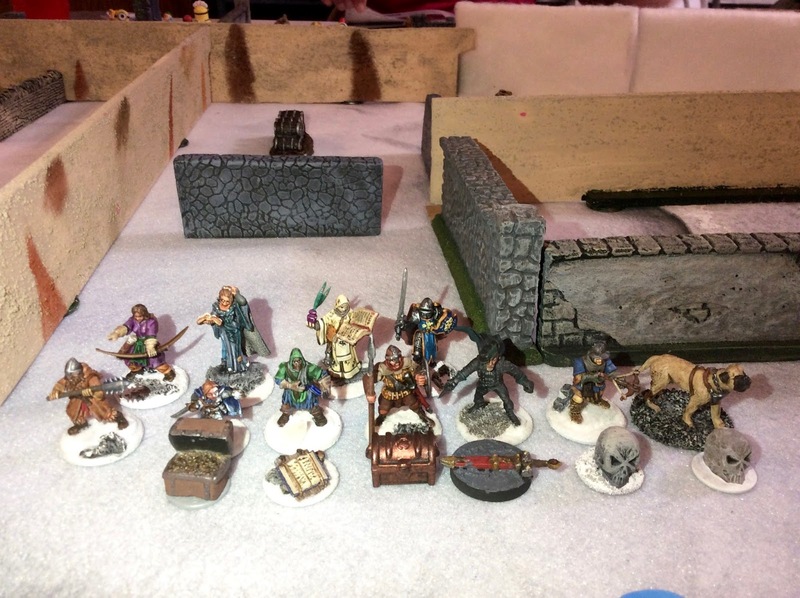 Quail and her group prepare to delve into the Ghoul King’s Lair. They had not gone far when Quail sensed a Draining Word spell against Telekinesis go into effect. "Bemis is here as well,“ she thought to herself. The Sigilist knew she would need all her wits to get them safely out of the current situation, so she began to chant the spell of Awareness. Her mind reached out to unlock her ability to sense future outcomes, but then her mind suddenly began to fold back in on itself, and she had to force her thoughts to re-open her link to special insight. Quail’s brain seared with pain and she felt dizzy. The chamber spun and she slumped up against a nearby wall to keep her balance, but the Sigilist had made the link to an awareness of possible futures. (Failed to cast spell, so pushed for 6 HP) "Bailey!” she called out. The Apprentice, who was off to the left, where she had just located the Reveal Secret treasure, let out a huff of frustration, and rolled her eyes. She turned and stomped towards the Sigilist. "Can you cast, Heal?“ Quail asked weakly as her Apprentice approached. Without replying, Bailey, put her hand out and pressed it against the side of Quail’s head. She mumbled the words for casting Heal under her breath, and her half-hearted attempt was met with a sharp pain behind her own eyes. (Failed to cast by 6 points, took 1 HP damage.) Her gasp of pain caused Quail to look up at her. "Are you alright?”, the wizard asked; but the young woman didn’t reply, and merely rubbed her own forehead to relieve the sting. Suddenly there was a creak of wood in the darkness above them, and a Ghoul dropped down onto the floor from above. (The Gru player put one of his two scenario Ghouls in the middle of my group.) The creature looked slowly around with dull eyes, and then launched himself at Cirvid the Warhound. The party’s opening advance towards the throne room. 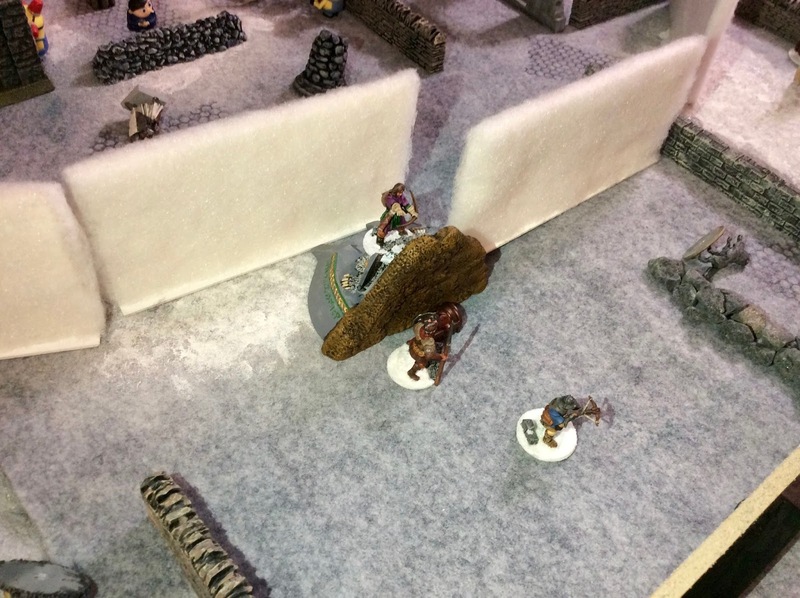 The first Ghoul has dropped from the ceiling and set upon Cirvid the Warhound. Quickly, Quail put her own hand on her forehead and chanted the words of the Heal spell. She immediately felt the burn behind her eyes lessen and her equilibrium returned. The Sigilist strode further down the rubble filled hallway, determine to locate a means to get out of this trap. She turned to Bailey, and said “Come on!”. The Apprentice followed and pushed right past her, plunging deeper into the darkness. Luc Demic, with his crossbow at the ready; and Sallisee, with her bow in one hand and a torch in the other, had also moved on ahead to scout a path with their keen eyes. In the distance, behind a crumbled wall, the Marksman and Ranger could see a large stone structure with a large ornate chair upon it. Then off to their left, they heard the clash of metal on metal, and could see the light from other torches. In the glow they could see the large yellow heads of Gru the Soothsayer’s strange minions bobbing up and down, as some of them fought a large armored Ghoul with a crown. They realized immediately that it must be the Ghoul King himself. In a matter of minutes, the yellow creatures had overwhelmed the Ghoul King and brought him down. Meanwhile, Cirvid had his teeth sunk into the arm of the Ghoul that had dropped from the ceiling, and shook vigorously. Sir Cardidil the Knight ran up to aid the dog, and with one slice of his sword, empowered by the Knight’s Ring of Life, the Ghoul was struck down. He had little time to rest on his laurels though; for behind him he heard a creak of wood, and as the Knight turned he saw a trap door in the floor open and a Ghoul climbed quickly out from some unseen room below and charged at him. And to make matters worse, another Ghoul dropped from a hiding spot in the ceiling and landed right between Bailey and Innis Flin the Treasure Hunter. Innis shouted at the Ghoul and attempted to distract him from moving towards the Apprentice. It worked and the Ghoul lumbered towards him. The party presses further towards the throne room and runs into Gru’s warband. Another Ghoul has dropped from the ceiling and a third has climbed out of the trapdoor. 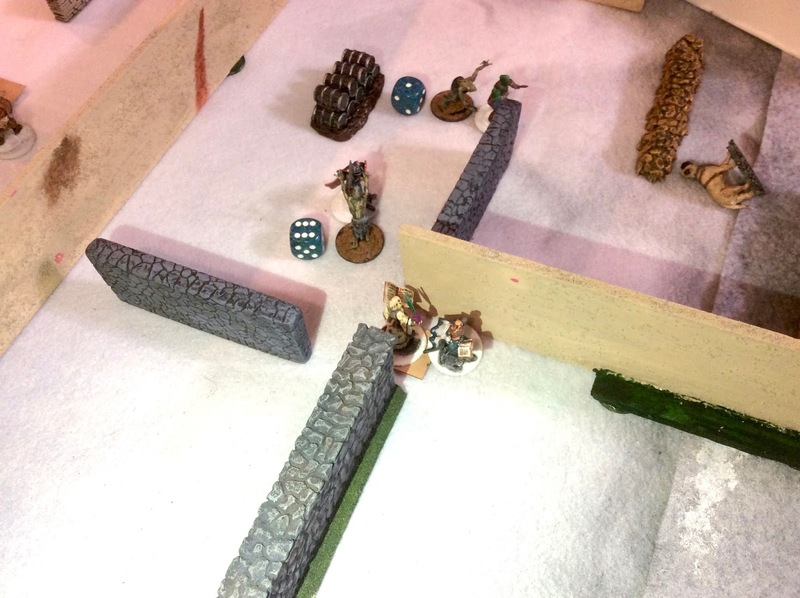 While Quail, Bailey, and their group advanced towards the Ghoul King’s throne, the Treasure Hunters, Dorchesman and Kinny, accompanied by the Barbarian, Clol had taken a path to the left through a different series of crumbling underground rooms, unnoticed by any enemy. Dorchesman was quick to locate and secure a treasure, while Kinny spotted another a little further on, and moved towards it. Clol tired to stay equidistant between the two in case either needed help. What he didn’t notice was the trapdoor on the floor nearby, and before he realized it, a Ghoul had jumped out of it and was upon him. It carried a bone club and swung it hard against the Barbarian, who instinctually raised his left arm to block it. The club made contact and Clol could feel a sharp pain shoot up through his elbow. He, in turn swung his mighty Cub of Battering around and caught the enemy cleanly in his torso. Though hurt, the undead creature shook it off and came at him again. Clol could not believe his eyes, for as they battled, another Ghoul climbed up out of the trapdoor and was immediately upon him as well. Back over with Quail’s part of the group, they had little time to think after the death of the Ghoul King, as Gru’s minions now noticed them as well. A crossbow bolt sliced the air, and hit poor Cirvid who, with a yelp, toppled over onto the stone floor, motionless. Quickly, Quail cast Fog, and called to Bailey to do the same. Two walls of mist appeared, blocking them from the view of the Soothsayers shooters. Sally and Luc pressed forward to a low ruined wall near the throne, where they saw Bemis’s hound trotting forward out of the darkness. Sally set her torch down and quickly took a bow shot, but missed. Luc fired his crossbow, and hit; the dog dropped to the floor. They also noticed a treasure sitting behind the throne, and called to Barc, the Man at Arms, to come retrieve it. Quail worried about the continued appearance of more Ghouls, and saw what she had to do. Since everyone around her was either busy with their own life or death struggle or out of view, the Maga Librarian realized it was up to her be the one to take care of the trapdoor. She cast another wall of Fog to replace one that suddenly dissipated, continuing to block Gru’s view of her warband, and then ran to the trapdoor and stood upon it; as there didn’t seem to be any way to lock it. The Sigilist called to her Apprentice, as she tried to think of some way to block the door other than with her body. She used Telekinesis to move a piece of rubble toward her, but realized one stone was not going to hold the door, and it would take to long for her to make a heavy mound of crumbled stones, even with Bailey’s help. Bailey came and stood by her, arms folded and back turned. Then, suddenly, the Apprentice walked away into the darkened chamber behind them. Quail could see a torchlight in the distance, but wasn’t sure who it belonged to, and why Bailisette suddenly left her to head towards it. She called to Bailey, but the Apprentice just ignored her. 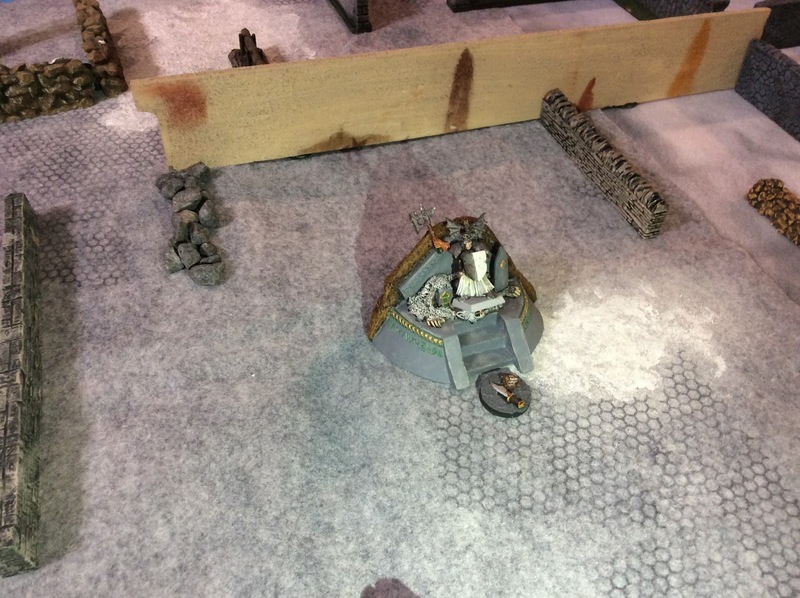 Quail moves on to the trapdoor as Innis and Sir Cardidl tangle with the two remaining Ghouls. In the far chamber where Clol battled the two Ghouls, the Barbarian was hard pressed. He was badly wounded, but had managed to kill the first Ghoul, and luckily for Quail’s soldier, the second Ghoul was fighting from a position on top of the trapdoor, so no more of his fellows could climb out. Kinny and Dorchesman had both retrieved their treasure chests, but were a bit at a loss as to where to go with them. They weren’t sure if they should drop them to help the Barbarian, or try to make their way to some safe spot…but where was it safe? 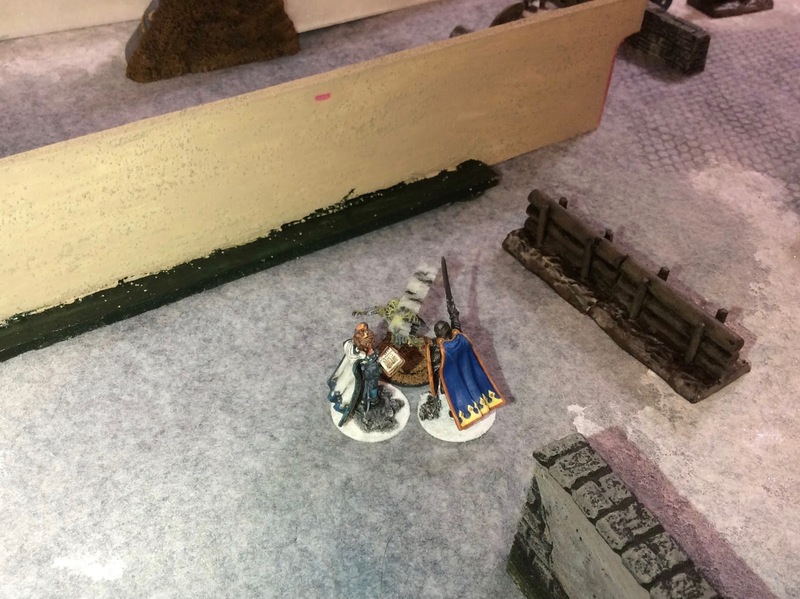 They didn’t have to puzzle for long, as Clol, and his Club of Battering soon took care of the lone Ghoul survivor, and the big Barbarian quickly moved to stand upon the trapdoor. The three of them had a hasty discussion and decided to stay put, until they heard if an exit had been located. For Clol’s part, he certainly did not seem inclined to want to step off the trapdoor at the moment. 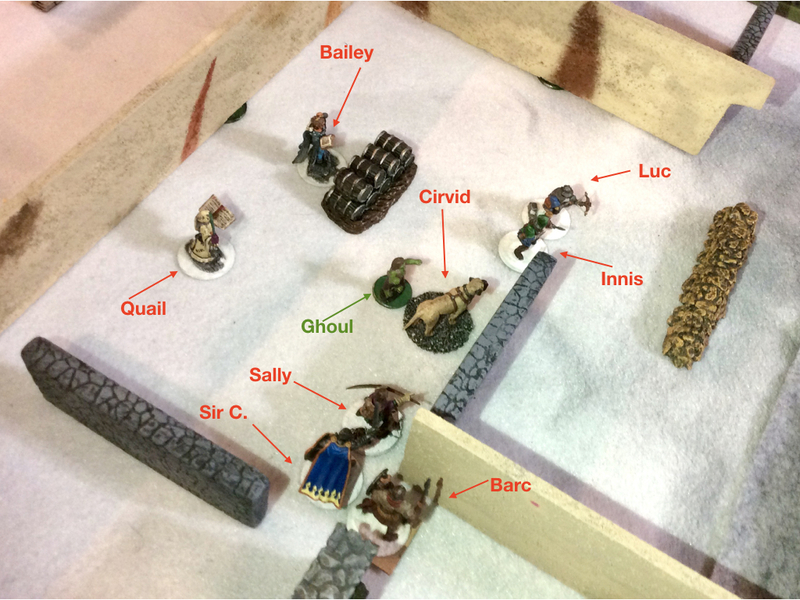 Sally climbs up on the throne to find the levers that operate the doors, as Barc recovers the treasure behind the throne, and Luc stands at the ready to provide covering fire. Back near the throne room, Quail called desperately to Sir Cardidil, “She’s run off!”, and pointed in the direction Baliey had gone. 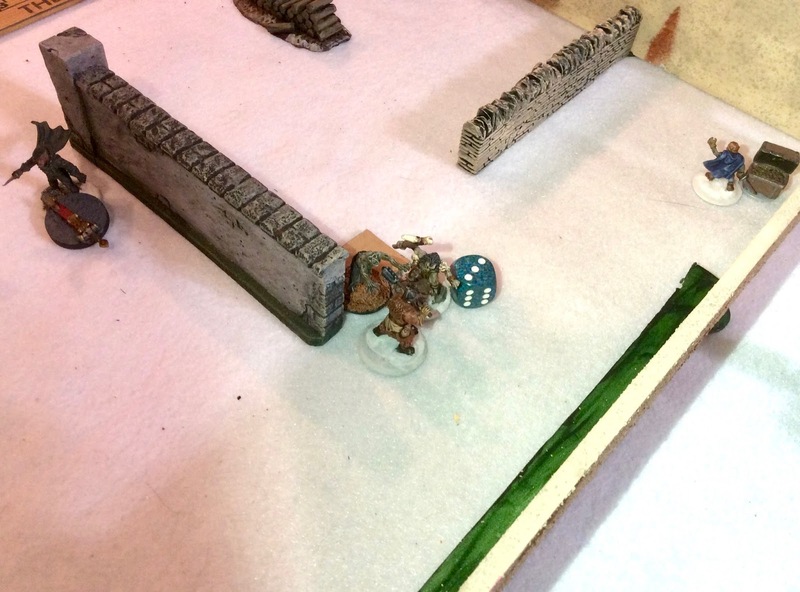 The Knight dispatched the Ghoul he was fighting with a final blow, and ran over to the Sigilist. Sir C. grabbed the torch from the wizard, and ran in that direction the Apprentice had gone. He didn’t go far before he spotted her. Bailey’s eye had been caught by torchlight she had seen in the distance; and she could have sworn, silhouetted for a moment in the flame she had seen a familiarly shaped cone hat bobbing around behind a low wall. Sure enough, as she approached she could see the top of the tall purple hat that Bemis’ apprentice, Agarn, wore. The flame from the boy’s torch flashed red in her eyes, and her anger burned. It seemed only logical to her that one cruel deed deserved another in return. "Let his apprentice live with the scars forever!“, she thought. Without thinking her hand went to the deadly vial in her pocket and her cold fingers coiled around it. She now ran towards the wall, and as she neared it, she pulled the vial out and hurled it with all her might. Bailey watched the glass cylinder turn end over end as it glided through the air and it hit the far lip of the wall near where she could see the pointed hat. Instantly the cylinder exploded in a ball of red flame, and a loud boom echoed back and forth between the walls of the low chambers. The burst of red flame was blinding in the darkness, and Bailey came to a stop as she was momentarily sightless. She strained to see the wall through the red flashing in her eyes, but the blast had blown out the torch. There was nothing before her, only darkness and silence, and dancing red spots in her eyes. Something snapped in her mind, and tears welled up in her eyes. She gasped, "What have I done!” Falling to her knees, the young woman sobbed, repeating over and over, “What have I done…what have I done..” She was so overwhelmed with weeks of pent-up emotion, that she didn’t even hear the tell tail sound of creaking wood in the ceiling, and was unaware of the Ghoul that dropped down almost directly in front of her. Bailey hurls the Explosive Cocktail at Agarn and the Treasure Hunter. Sir Cardidil, leaned over and helped the young woman to her feet, she was so overcome with emotion, the aged knight wasn’t quite sure what to do; but his first instinct was safety; so after retrieving the torch he dropped, he forced the Apprentice back away from the immediate area of danger. By this time, Innis had killed the Ghoul that had dropped near him earlier, and he now ran back to find Quail. When the Sigilist saw him, she called, "The Grimoire by the door we came in; get it!”, and the Treasure Hunter nodded and let the Siglist know that Sally was working on an exit for them. He then ran back the way they had come in to retrieve the book. 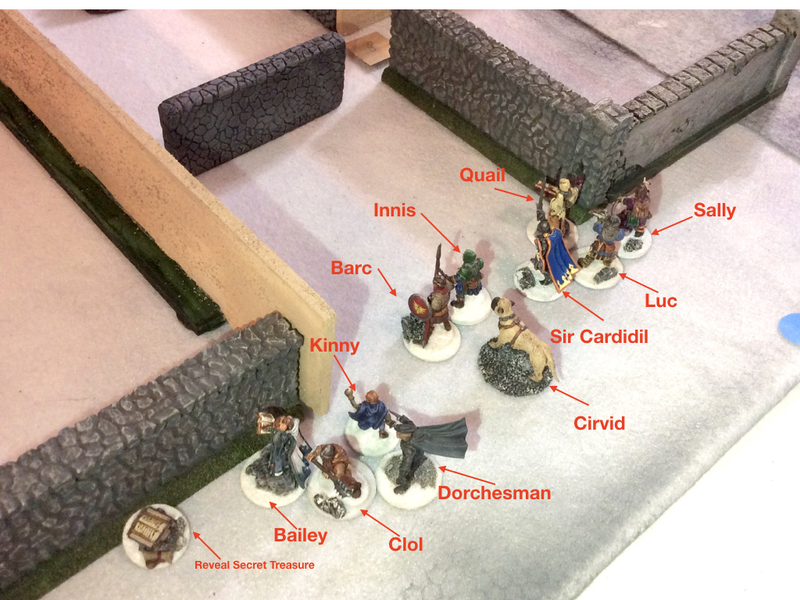 As a Ghoul drops from the ceiling in front of Bailey, Quail hits the creature with a Furious Quill and Sir Cardidil rushes to the Apprentice’s aid. While she slowly and methodically worked her way down the row of levers, Barc had retrieved the chest by the throne, and was heading back the way they had come in, and Luc had moved forward to make sure no new threats appeared from the far side of the throne room. Suddenly, a trapdoor opened in the chamber on the far side of the crumbled wall where Luc stood, and a Ghoul emerged and lumbered towards him. The poor Marksman then could not believe his eyes as two more dropped from hidden doors in the ceiling. 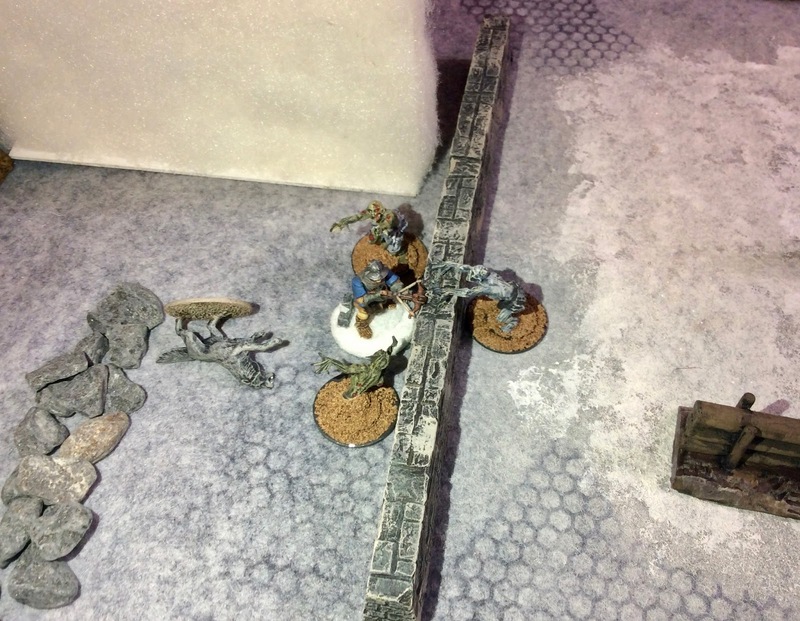 (Gru and Bemis decided it was a good time to use up their remaining player controlled Ghouls). Luc fought bravely, and killed one of the monsters, but he was no match for all of them, and they quickly overpowered him. Back at the tower they were able to take stock of all they had retrieved from the Ghoul King’s Lair. They had luckily managed to come away with four treasures. There were two Grimoires: Wizard Eye and Explosive Rune; as well as a Book of Rangifer, and a Belt of Animal Repellence. There had been a good deal of gold too; 320 Gold Coins; and Quail figured if she sold the Book of Rangifer to the university, that would bring in another 150 in gold coins. They had gotten off well injury-wise also. Cirvid had been badly wounded, but a 10 GC salve would mend him up nice and quick. And Luc had somehow managed to survive the Ghoul attack relatively unharmed. Later that night Quail sat in her room and considered the day. It had been a trap they had walked into, pure and simple. She would be more careful in the future following wild rumors. However, it did mean that they were a threat to someone, or something, but who? Then her mind turned to young Bailisette. Her Apprentice seemed, at last, to truly be on the mend now. The Sigilist wasn’t sure what exactly happened in the chamber where her Apprentice had run to, (she had only bits and pieces of the story from Bailey and Sir Carididil,) but whatever it was, the emotional surge that had overtaken the young woman had seem to clear away a lot of the demons that had haunted her. Quail knew she would have to find out the full story later, and that there was still a way to go before the old Bailey was back; but she was content for now that the anger seemed to be gone. And, if the wizard was not mistaken, as they all took their evening meal, there had even been the briefest of happy smiles pass over the girl’s face as she sat quietly and listened to the others joke and laugh about their exploits during the day’s adventures. It certainly was an interesting game! I’ll give the author credit, each scenario in this book has offered it’s own unique challenges to overcome; which have been fun to tackle. In this one the darkness and all the walls meant that there was very little the Spell Casters could do, as there were seldom targets to be seen. Also, the Warbands, to a large extent, had only the briefest of contact. This was mitigated by the continually appearing Ghouls, and wandering monsters (Though, luckily, no wandering monsters ever entered in Quail’s area.) The trapdoors became particularly problematic, as more folks started standing on them, the chances of the Ghouls popping out of the ones by me jumped significantly; so I had no choice but to stand on them myself. We made one error in set up, as we originally set the table for 6 players, then when we found out we were only going to have 5, we reset things so instead of 3 thrones and kings/queens we had only two. In doing this, we didn’t pay attention to the new spacing of the thrones (we were eager to start playing! ), and it turned out that from two of the starting zones, (Gru’s and Basil the Enchanter’s) the thrones could be easily seen and brought under missile fire in turn 1. This meant, in both cases, that the battles for the throne rooms were rather one sided. Luckily for me, Gru was content to kill the King, gather the amulet, and the closet throne treasure, and move on, rather than stay and fight for the remaining treasure and levers. Quail had a good outing with 9 spells cast, 3 levers pulled, 7 Ghouls killed, and 4 treasure recovered; for 390 Experience Points. Also, 470 Gold. And, another trip where no one died. I’m not sure how long this luck will last.